The Texas month-to-month lease termination letter is used to terminate a month-to-month lease agreement between a landlord and tenant. Although the landlord need not provide reasoning for the termination, they cannot terminate the agreement in discrimination (or retaliation) of the tenant. 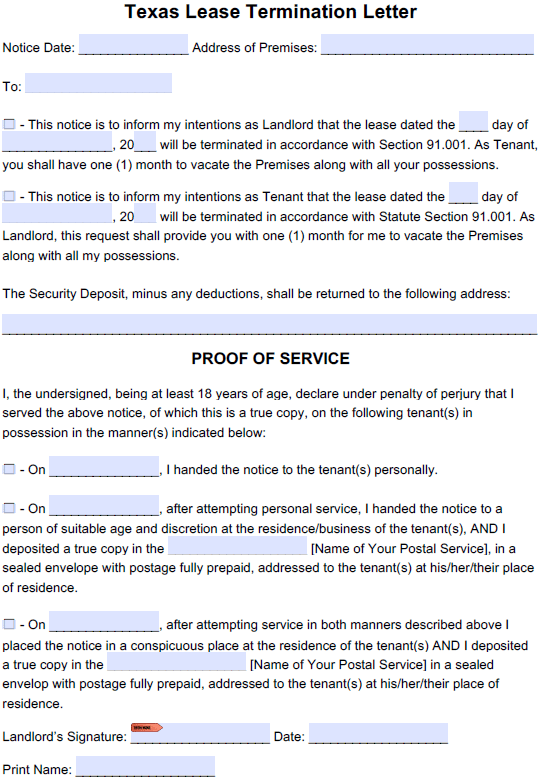 The notice provides the tenant with thirty (30) days to vacate the rental unit. If the tenant does not move out within the thirty (30) day period, the landlord can then sue them for possession of the property by filing an eviction suit in justice court. Note: This notice can also be used by a tenant to inform their landlord of their intention to terminate the rental agreement and move out of the unit.